I wrote about some of the findings from this new paper for a WaPo post this AM, but there’s a ton more to be said about it, as the authors have created a very rich data set on US income. My point this AM was that these data–and more about the data in a moment–strongly support the case that, while I’m all for faster growth, that alone will not reverse the post-1980 trend in inequality. The second figure in my piece provides a very simple, rough decomposition of the impact of slower growth and inequality on the average income of the bottom half of adults, showing that about two-thirds of the stagnation is attributable to the growth of inequality. One complaint about that finding, as I note in the piece, is that the income slowdown could be demographically driven, as the increased shared of retirees over this period is putting downward pressure on income growth. The figure below, from Piketty et al’s paper, challenges that suspicion by breaking out the income trends of various age groups. 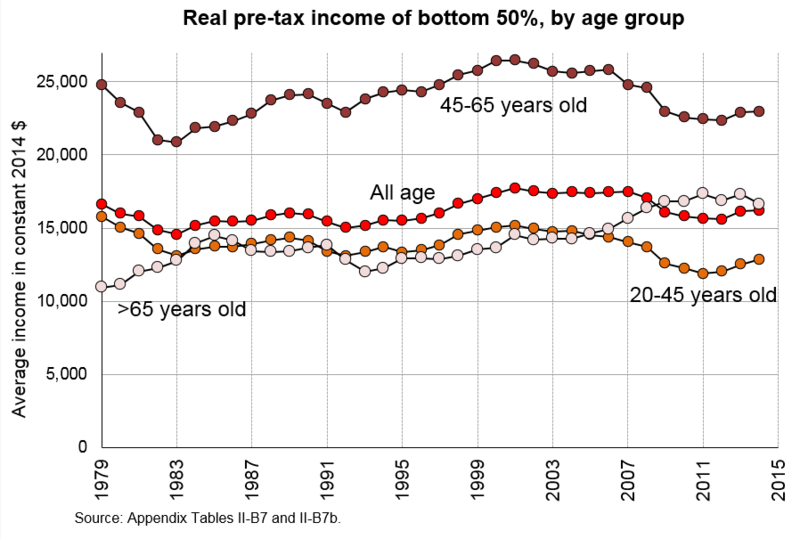 In fact, the only group whose income is up over the period is the >65 folks. Of course, their incomes are below average over most of the period, so there could still be a composition effect here, but there’s no questioning, at least based on these data, that working-age adults faced seriously stagnating incomes over this period. Regarding the data, the compilation of this information, which distributes aggregate, national income to individual adults, is a Promethean task for which I give the authors tremendous credit. There’s no way to complete this exercise without many, many assumptions, and as is always the case in economics, every assumption can be questioned. They have to make assumptions about the incidence of taxation–whose income gets dinged–about government spending–who benefits from spending on infrastructure or defense–about how income is shared in families, and many other gnarly questions. So far, I’ve seen little to which I’d object, and to their credit, far more than almost anyone in our business, they provide a) the underlying data, so you can see for yourself how some assumptions play out, and b) various tabulations based on alternative assumptions. I don’t have a better way to do it, but this seems off to me. It seems to assume that deficits get fully paid off–through higher taxes and lower spending–in the year they occur. I understand the assumption in the accounting sense of hitting their national income target, but it’s a) unrealistic, and b) much more importantly, can have a significant and unrealistic negative impact on incomes in periods of large deficits (and vice versa for surpluses). My intuition would be to leave it out and punt on hitting national income. To do so wouldn’t make a ton of difference outside of periods when the deficit grows a lot, periods when their current method, I’d argue, returns a result that doesn’t really show up in adult incomes. That said, they’d give up a lot conceptually and in terms of simple presentation if they gave up on hitting national income, so there’s a trade off. I will noodle on this further as should the authors, whose noodles are far stronger than mine. Much more to come on this–I’m saying nothing here on the new Chetty et al work as I haven’t yet spent as much time with that relative to this Piketty et al paper. I will say this about Chetty et al. Many of us hypothesized that as inequality increased sharply, it would create barriers to upward mobility. The number of kids stuck in neighborhoods without inadequate investments, barriers to quality educational access, and so on, would grow. This, we thought, might slow the rate of mobility as those children aged. Earlier work by Chetty et al suggested that the rate of relative mobility had not, in fact, slowed over time. This new work suggests that at least by the metric cited in my WaPo piece, it slows considerably. That’s a very important and interesting finding which I’ll be looking into more carefully in coming days. Share the post "Important new work on inequality and immobility"
3 comments in reply to "Important new work on inequality and immobility"
You are missing the $64,000 question. Literally. I don’t think it’s an accident that the paper shows in Table 1, row 1, page 37, Average income for all adults (20 and over) in the U.S. 234 million is $64,400. The US could pay every adult $64,000 leaving family incomes of couples at $128,000. Of course it gets better, because if you limited the numbers to full time workers at 130 million, and excluded capital income, and social security benefits, you still get $75,000 . Obviously you don’t wan to pay everyone the same amount, but shows a floor of $50,000 is very workable (vs. current median of $40,000 for full time workers) For every five people working at $50,000 you could pay someone $200,000. Next, please note the middle 40% (the top 50 to 90%, meaning neither in bottom 50% nor top 10%) got practically no increase in income since 2000. They got small (tiny?) increase of around 6% to 7% post tax income (1/2% increase per year) attributable to transfers. The incomes for that range start around $40,000 and top out around $127,000. The stagnant wages of middle class shows in part the glut of the educated on the job market. There is no high skills shortage, and definitely no STEM job skills emergency. Instead new college graduates are taking jobs away from less credentialed, boosting levels of unemployment for those without degrees, rippling on down to the those with the least skills. If you want to ignore this statistic, go ahead. It matters whether it’s a cause of effect, but ignoring it doesn’t make it go away. It may relate to childhood poverty and government sponsored childcare issues or family friendly work schedule issues, etc. Also in table 1, $1 million as late as 1963 had 90% marginal rates. You can’t ever achieve previous levels of equality without those rates. I suspect the near total loss of bargaining power of labor is the main reason that low unemployment has not filtered into general price inflation. Years of deunionization, small-government attacks on public sector employees, gig employment. Comparisons to eras when labor could influence wages paid could be irrelevant. This is a new era with capital totally dominant. Old benchmarks don’t apply.